The news came in quick and fast late last night when I could barely keep my eyes open after a long day of work. 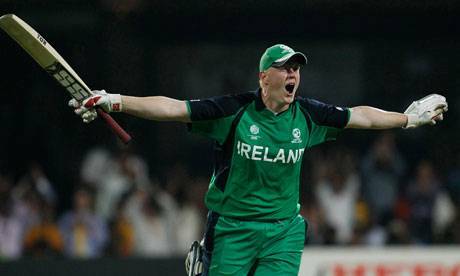 Ireland had just beaten England in the 2011 Cricket World Cup in India. Not only had Ireland, considered a minor team in the World Cup, just beaten England – the home of cricket – but they had beaten them and smashed records in the process! Kevin O’Brien not only scored a massive 113 from 63 balls, but he also smashed the record for the fastest century ever in the World Cup, smashing six sixes and 13 fours in a 50-ball hundred. Let’s put this into even clearer perspective with a list of the top 5 fastest centuries scored in Cricket World Cup history. The Irish victory is even more incredible when you consider that the English team have been on form for the past few years, enjoying a strong resurgence and claiming impressive victories over the Aussies in the Ashes. Furthermore, not only did England post a huge total, but Ireland got off to a troubled start, they were 111 for five in the 25th over, needing 328 for victory – for those who don’t follow cricket, Ireland had gotten 1/3 of the required runs in 1/2 the game, whilst losing half of their team – never a good sign. The bookies agreed, and at one point they were offering 150-1 for an Irish win. What happened in a half-filled Chinnaswamy Stadium on Wednesday was not just the finest day in the history of Irish cricket. It was, certainly, a result and a performance better than their mythic win over a well-entertained West Indies team on a damp Sion Mills wicket in County Tyrone 42 years ago, and more complete than their upset of Pakistan in the last World Cup. But it was also a seismic event that shredded English complacency bordering on arrogance, a cricket match to warm the French cockles of Marc Lièvremont. It was a victory, too, that buzzed through all electronic conduits with the message that this World Cup – derided beforehand as loaded with soft and irrelevant fixtures – is no longer a place for comfortable assumptions. It has been the greatest day of our lives, the best performance that we have put up. We believed in ourselves, Kevin O’Brien was brilliant. We knew that we are capable of winning, we believed in ourselves. Cusack and Mooney too chipped in and credit to the lads for their effort. We have still got four games left, hoping to repeat such performances and stay in the race. Following on from the stunning victory Ireland achieved over Pakistan on St. Patrick’s Day in the 2007 World Cup, this victory over England yesterday helps to justify the fact that Ireland are no longer a ‘minnow’ in the cricketing world, but truly a force to be respected, and we can hope that the ICC will now consider granting Ireland full test-cricket status which will give cricket in Ireland an even greater chance of flourishing. A final note, I must doff my hat to my younger brother, Andrew Leonard. He’s an absolute cricket fanatic and has been playing the game since he was a child, quickly besting my mediocre cricketing abilities. He’s currently the Development Officer for Cricket Ireland, and has been coaching teams in Ireland at a variety of levels and has introduced the game to hundreds of children in national schools in the Fingal area of Dublin. Photos of the Irish victory!